By 1905 the neighborhood of 34th Street and Fifth Avenue had drastically changed from a generation earlier. Where the brownstone mansions of the Astors had stood on Fifth Avenue between 33rd and 34th Streets the massive Waldorf-Astoria Hotel loomed over new commercial buildings and the residences that still clung on. Commerce had not engulfed the entire region, however, and that year Charles H. Ditson filed plans for his new mansion at No. 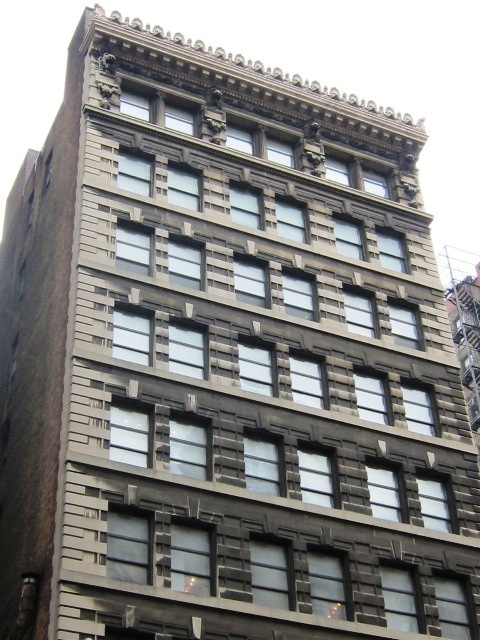 19 East 37th Street to be designed by C. P. H. Gilbert. Ditson’s residence would be next to the imposing French chateau of Joseph De Lamar under construction, also designed by Gilbert. The mansion was not the only new construction Ditson had in mind at the time. Ditson’s fortune began generations earlier when in 1826 Oliver Ditson, a clerk in a Boston bookstore, began learning the printing trade. Also a church organist, he combined his interests in printing and music into his own business in 1835 as a music-seller and publisher. By the end of the Civil War the firm had branch offices in Cincinnati, Philadelphia and New York. Son Charles took over the New York concern, named Chas. H. Ditson & Co. and built an impressive building on Fifth Avenue; later expanding to a new building at 867 Broadway. By the time Charles was planning his new mansion, the firm was nationally-recognized as a leader in music publications; printing Dwight’s Journal of Music, The Monthly Musical Record and The Musician. An 80-volume series entitled “The Musicians’ Library” had been published along with numerous instruction books. 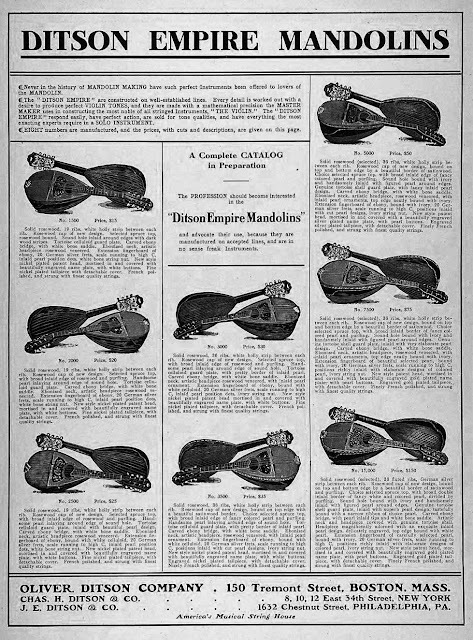 Musical instruments had now been added to the sheet music and books being sold. It would be a building “of pleasing design,” promised the article. Designed by Townsend, Steinle & Haskell, it was faced in Indiana limestone. The Beaux Arts structure featured expansive showroom windows at the first and second floors. Centered in the cornice above the second floor would be an intricately-carved leafy cartouche in the form of a lyre—symbolic of the musical roots of the firm. A lyre and crossed horns set the musical theme. Between the third and fourth stories, a carved balcony was ornamented with four exuberant copper lamps and the proud announcement DITSON BUILDING spelled in bold copper lettering. An overhanging cornice would be decorated with classical antefixae. The four large lamps along the balcony have lost their properly-proportioned milk glass globes. The company took the lower four floors and the basement. The upper six floors were intended for rental income. The first floor was devoted primarily to sheet music and books, the second to “small goods,” and the third floor sold “talking machines,” or phonographs. Pianos were displayed on the fourth floor, while the musical book section took up the basement area. When Ditson moved into the new building it sold only Briggs and Poole pianos, somewhat apologetically noting “Other lines will probably be taken on.” In 1910 it scored a coup by becoming the sole representatives for Baldwin pianos. A pile of donated instruments awaits repair in the Ditson Building in 1919. Music Trades magazine said "Like the boys who used them, they have all seen service." copyright expired. The same year booksellers Scott, Foresman and Company was in the building. Ironically, with the war against Germany just ended, the company advertised Chester Nathan Gould’s “Handy German Grammar” for 50 cents. Ditson added to its piano offerings in 1922 by introducing the player piano. The sensation was worth devoting an entire street-level showroom to the amazing instrument. The Music Trades magazine reported that the window display drew large crowds. The article said that the Janssen Palestrina player “occupied the center of attraction in the window and no other merchandise, with the exception pf a few rolls, was exhibited with the instrument, so that attention could be concentrated on the one big feature of the display.” The piano’s mechanism was exposed and a large chart pointed out the features of the self-playing apparatus. After doing business in New York City for 62 years, Charles Healy Ditson died in his house on East 37th Street in May, 1929. Within a year John Jacob Astor’s daughter, Princess Serge Obolensky (formerly Alice Muriel Astor) purchased the Ditson Building. Chas. H. Ditson & Co. leased back its retail space from the princess. Three years later, on June 7, 1932, Ditson’s vice president and publishing manager William Arms Fisher addressed the annual meeting of the Music Publisher’s Association in the Hotel Roosevelt. The members were panicked with the marked decline in classical and high-class music sales, and the nearly equal increase in Tin Pan Alley sheet music. The deduction was that American taste had eroded. Instead, he said, the drop in music sales could be blamed on the Depression and that new household appliance—the radio. Things change and by November 10, 1946 the Chas. H. Ditson company was no more and the Princess Obolensky was now Mrs. Alice Astor Bouverie. Mrs. Bouverie sold the Ditson Building on that day to a merchandising group as the 34th Street neighborhood changed to one of garment companies and other small businesses. Four giant, snarling lions' heads look down from below the exuberant cornice.